Venice attraction-guides.com - Venice, Italy attractions guide Venice Grand Canal (Canal Grande) information about attractions, open hours, admission charges, architecture, landmarks, cruises, location and address, general tourist information about the Grand Canal (Canal Grande) in Venice (Venezia) area, Italy (Italia) IT - Last updated 30/10/2012. 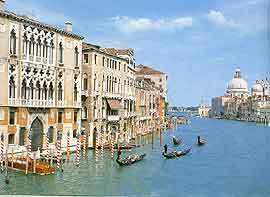 The Grand Canal (Canal Grande) in Venice is a wonderful stretch of water, often referred to as 'the most beautiful street in the city of Venice'. Travelling along Venice's historic Grand Canal (Canal Grande) is a popular way to see some of the city's most spectacular attractions, landmarks and stylish architecture. A cruise at night along Venice's Grand Canal (Canal Grande) a particularly memorable experience, with the moonlit architecture of Venice reflecting in the water.